Do you like witchy paranormal tales? You’re in luck! This witchy storybundle features lots of spooky great novels. Plus part of every sale goes to cool writerly causes like Girls Write Now and Mighty Writers, which help aspiring authors to reach their dreams. Here are the books, including my Witch of the Cards. Below I’ll tell you how to order and start reading! Spring has always been a time for witches, magic and the influence of the Other World in pagan folklore. 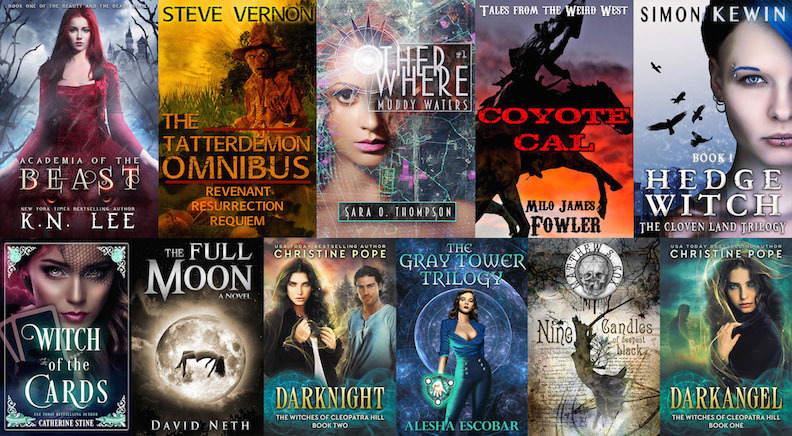 The Celtic festival of Beltane is traditionally observed on May 1st, and April 30th is also known as Walpurgis Night – or in Germanic folklore Hexennacht, literally “Witches’ Night.” What better time, then, to partake in the Witchy Bundle, your chance to grab a collection of ten truly magical books that involve witches of one sort or another. This collection takes us across our own world and into others. There are American witches and witches battling the Nazis in war-torn Europe. There are dark twists on fairy tales and witches in the wild west. There are witches who don’t know they have the power or the sight until dire need comes upon them. Thrillers, fantasy, romance, horror, mystery –These ten books feature bestselling authors as well as rising stars. The list includes Simon Kewin’s urban fantasy Hedge Witch, first in the Cloven Land Trilogy. We also have my Witch of the Cards, David Neth’s The Full Moon, the first in his Under the Moon series. Christine Pope gives us Darknight, a Witches of Cleopatra Hill tale, and Alesha Escobar has her thrilling Gray Tower trilogy. Matthew S. Cox contributes his Nine Candles of Deepest Black and Sara O. Thompson her Muddy Waters, the first in the Otherwhere series. Milo James Fowler’s Coyote Cal omnibus takes us to the gunslinging weird west and Steve Vernon gives us his spine-chilling Tatterdemon omnibus. NY Times bestselling author K. N. Lee’s book in the bundle is Academia of the Beast, a dark retelling of Beauty and the Beast. At StoryBundle name your price — whatever you feel the books are worth — and a portion of the proceeds goes to Mighty Writers and Girls Write Now. For $5, get the basic bundle of five books in any ebook format—WORLDWIDE. If you pay $15 (or more, if you feel generous), you’ll get the five bonus books as well. The Witchy Bundle runs for three weeks only. If you pay more than the bonus price of just $15, you get the regular titles, plus these five more: The Full Moon by David Neth • Nine Candles of Deepest Black by Matthew S. Cox • Darkknight – The Witches of Cleopatra Hill Book 2 by Christine Pope • Witch of the Cards by Catherine Stine • The Gray Tower Trilogy by Alesha Escobar. This bundle is ONLY available until May 18 via this link. So if it sounds good nab it before the time flies away. Storybundle allows easy reading on computers, smartphones, and tablets as well as other ereaders via file transfer, email, and more. Also, give the gift of reading with StoryBundle, thanks to gift cards – which allow you to send someone a code to redeem any future StoryBundle bundle – and timed delivery. Get quality indie reads for only about 67 pennies per book while you donate to great writing programs! What a cool source of curated quality titles for thirsty readers. I am an attending author May 3 to 7 at RT Booklovers Convention in Atlanta, Georgia! Come visit my Catherine Stine/Kitsy Clare booth at the RT Roundup on Sunday, May 7 from 10 am to 1 pm! Reader Roundup tickets here. To see all of the attending authors click here. Or head over to my events page for details. 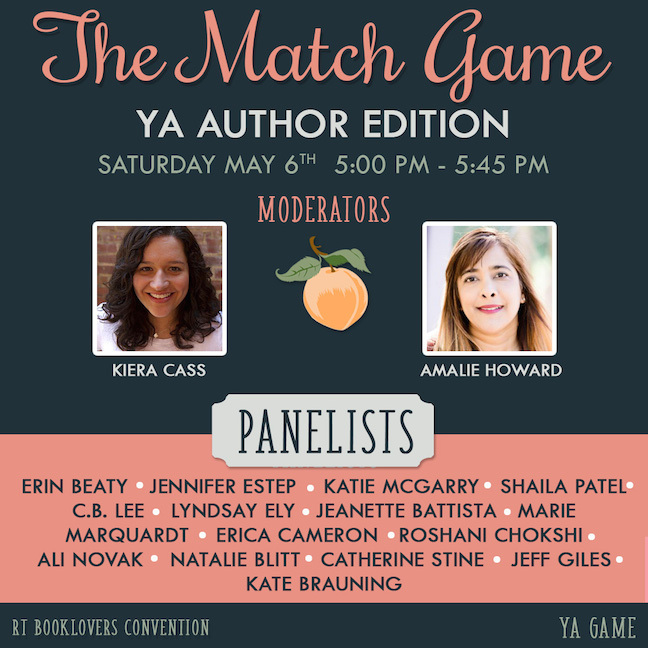 I will also participate in the Teen Day Match Game on Saturday, May 6, which you can read about there too. So, if you’re in or near Atlanta, stop on by! Want to reserve copies of my signed books? Click here. This entry was posted in Blog by kitsy. Bookmark the permalink.